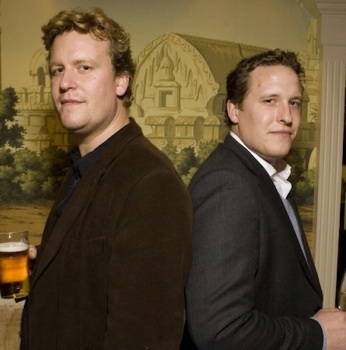 Ed and Tom Martin of ETM Group are set to launch their 10th venue near the Barbican in London this March. The opening of The Jugged Hare will also mark the launch of ETM’s own bottled pale ale of the same name. Formerly The King’s Head and located on the corner of Chiswell Street and Silk Street, The Jugged Hare will be a British gastropub with an open kitchen and a fine wine and beer focus. Taking its name from an 18th century English recipe – which will feature on the pub’s menu throughout the game season – The Jugged Hare is currently undergoing a full refit. The 4,000 sq ft site will include a 40-cover public bar, a 60-cover dining room and a lower level private room for up to 40 seated and 60 standing. This private room can also be split into two rooms. Head chef Richard O’Connell will take charge of the open kitchen, which forms part of the main dining room. Customers will watch the kitchen team prepare and serve their food from a state-of-the art eight-spit rotisserie as well as a charcoal grill. Seasonal game, meat and wild fish and shellfish will be roasted and grilled on a daily basis. The ale, brewed in conjunction with Sambrook’s Brewery, is 4.2% abv and is made from an English malt, hops and a unique yeast that gives the beer a citrus flavour. In addition, there will also be four British cask ales on draught, two of which will always be from a London based brewer. A Bloody Mary menu will accompany the Sunday roasts and over 100 wines will be available by the bottle and carafe. A “Wine By The Glass” dispenser and preservation system will also allow fine wins such as Bruno Clavelier’s Vosne Romanée 1er Cru La Montagne 1999 and Château Cos d’Estournel 1990 to be served by the glass. The restoration of the Grade II-listed property, once part of the Chiswell Street Whitbread Brewery, includes exposed ceramic tiles on the vaulted ceilings and walls and oak timber floorboards throughout. The main focal point of the bar is a back bar display of antique and exclusively British cased taxidermy all selected and positioned by the owners. Other pub features include the original brass ironmongery from the old brewery, anaglypta wallpapered high ceilings and antique whisky barrel high tables. The dining room features red leather booths, bar stools that allow diners to sit at the kitchen pass and light fittings from Tom Dixon. Tom Martin said: “This is a project that we have been working on for a very long time and it will be a pleasure to showcase our genuine passion for British produce, particularly meat, game and wild fish and shellfish, alongside fine wines and real ales in an English pub setting”.